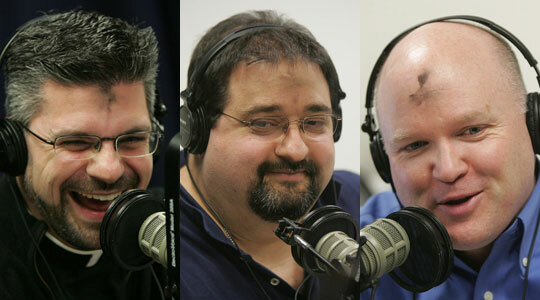 Summary of today’s show: On Ash Wednesday, Scot Landry and Fr. Matt Williams discuss with Dom Bettinelli the message from Pope Benedict for Lent in which he calls for the renewal of the old practice of fraternal correction. We must care for our brothers and sisters enough to not remain silent in the face of choices they make that may affect their eternal salvation. Some may call it judgmental meddling, but when done with love, compassion, and within a relationship based on Christ, it can be a loving experience of God’s mercy. 1st segment: Scot and Fr. Matt and Dom Bettinelli take the opportunity of Ash Wednesday to discuss the following message of Pope Benedict for Lent 2012. “Being concerned for each other” also entails being concerned for their spiritual well-being. Here I would like to mention an aspect of the Christian life, which I believe has been quite forgotten: fraternal correction in view of eternal salvation. Today, in general, we are very sensitive to the idea of charity and caring about the physical and material well-being of others, but almost completely silent about our spiritual responsibility towards our brothers and sisters. This was not the case in the early Church or in those communities that are truly mature in faith, those which are concerned not only for the physical health of their brothers and sisters, but also for their spiritual health and ultimate destiny. The Scriptures tell us: “Rebuke the wise and he will love you for it. Be open with the wise, he grows wiser still, teach the upright, he will gain yet more” (Prov 9:8ff). Christ himself commands us to admonish a brother who is committing a sin (cf. Mt 18:15). The verb used to express fraternal correction – elenchein – is the same used to indicate the prophetic mission of Christians to speak out against a generation indulging in evil (cf. Eph 5:11). The Church’s tradition has included “admonishing sinners” among the spiritual works of mercy. It is important to recover this dimension of Christian charity. We must not remain silent before evil. I am thinking of all those Christians who, out of human regard or purely personal convenience, adapt to the prevailing mentality, rather than warning their brothers and sisters against ways of thinking and acting that are contrary to the truth and that do not follow the path of goodness. Christian admonishment, for its part, is never motivated by a spirit of accusation or recrimination. It is always moved by love and mercy, and springs from genuine concern for the good of the other. As the Apostle Paul says: “If one of you is caught doing something wrong, those of you who are spiritual should set that person right in a spirit of gentleness; and watch yourselves that you are not put to the test in the same way” (Gal 6:1). In a world pervaded by individualism, it is essential to rediscover the importance of fraternal correction, so that together we may journey towards holiness. Scripture tells us that even “the upright falls seven times” (Prov 24:16); all of us are weak and imperfect (cf. 1 Jn 1:8). It is a great service, then, to help others and allow them to help us, so that we can be open to the whole truth about ourselves, improve our lives and walk more uprightly in the Lord’s ways. There will always be a need for a gaze which loves and admonishes, which knows and understands, which discerns and forgives (cf. Lk 22:61), as God has done and continues to do with each of us.